LINE Webtoon (http://www.webtoons.com), the popular digital comics publisher pioneering the development and distribution of comics worldwide, and comic publisher Legendary Comics announced today a partnership to develop new digital comic titles exclusively for the LINE Webtoon platform. 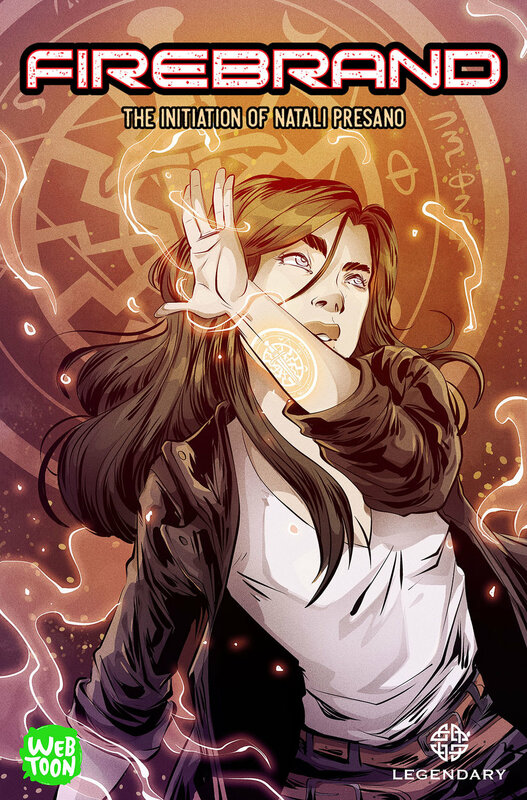 The partnership kicks off today with a sneak peek at the first three chapters of new series Firebrand: The Initiation of Natali Presano, a thrilling supernatural series created by Nerdist’s host Jessica Chobot and author Erika Lewis. Created and written by Chobot and Lewis, with artwork by Claudia Aguirre, Firebrand follows willful witch Natali Presano. Natali never fit into her father’s perfectly human world: politically ambitious, he turned his back on her just when she needed him most. Having lost her mother to tragedy as a young child, Natali flees the safety of home into the arms of her aunt Selena, the mysterious guardian of a magical order waging a centuries-old war for survival in the mountains of Spain. Natali, now in her 20s, has followed in her aunt’s footsteps, becoming a powerful but rebellious witch in her own right. Returning to Seattle, she finds herself caught between a cruel modern world and the ancient evil threatening to destroy it. The series will officially launch on January 26, 2017. Jessica Chobot is best known as host for Nerdist News. Before joining Nerdist, Chobot hosted several shows on IGN and frequently appeared as an industry expert on G4. Following a successful career in television production, Erika Lewis turned to writing. In addition to Firebrand, Lewis is also the author of the soon-to-be released Game of Shadows, and The 49th Key. The announcement of LINE Webtoon’s partnership with Legendary Comics comes off the heels of the exciting news that LINE Webtoon has signed with CAA, who will exclusively represent LINE Webtoon’s portfolio of comic titles for film and television opportunities in the U.S. Readers can check out the first three chapters of Firebrand: The Initiation of Natali Presano exclusively on LINE Webtoon here, with new chapters debuting in January. To download the official LINE Webtoon app, visit the Apple App Store and Google Play. Jessica Chobot is represented by Natasha Bolouki at UTA and Erika Lewis is represented by Rob Wolken at Rain Management Group. Both are repped by Darren Trattner at Jackoway Tyerman Wertheimer Austen Mandelbaum Morris & Klein.